Period: 20 May 2017-30 May 2017. Distance: 2,915 km. We followed to a great extent the Daisy Route (Danish: Margueritruten) an autoroute of about 3.700 km, of which we deviated regularly. In these ten days we traveled mainly in Jutland. – Ribe, a beautiful old town. What is particularly striking is the use of colors. Almost Caribbean. The light was beautiful. We were there during the golden hour. – The sculpture group Mennesket Ved Havet. Impressively high white sculptures of men who look out over the sea. Beautiful to photograph. – The bunkers on the beach at Blåvand. An artist has put heads and tails of horses on the bunkers. It has become a beautiful setting on the beach. – The Thy National Park, which includes a lighthouse from 1883. But also the Stenbjerg Landingsplads, here are white houses, where the fishermen once stored their tools, nets, etc. Beautiful light gave it a magic atmosphere. – An evening, again with really beautiful light, on the small beach of Nørre Vorupør. There was a strong wind, which caused high waves. There were beautiful colourful fishing boats on the beach and the light was magical. Our cameras are not fond of sand, but we could not let this pass us. – Near the Børglum Kloster is the Oxholm Molle. A special octagonal mill from 1857. – The Rudbjerg Fyr, A lighthouse, which is disappearing in the sand, was probably the most beautiful place this holiday. The undergoing lighthouse with the sand dunes around it are truly spectacular. You imagine yourself in a desert. – The Tilsandede Kirke. Just like the Rudbjerg Fyr this church began to disappear after violent sand storms in 1775. – The beach at Mulbjerge. The coast of East Jutland is very different from the coast of West Jutland. The west and north very wild and rugged, the east friendly and some tame. This is an idyllic beach. Children caught fish with small fishing nets. A few white houses. A wooden pier that goes very far into the sea. Period 20 May 2018-1 June 2018. Distance 2,900 km. We continued the Margueritruten. 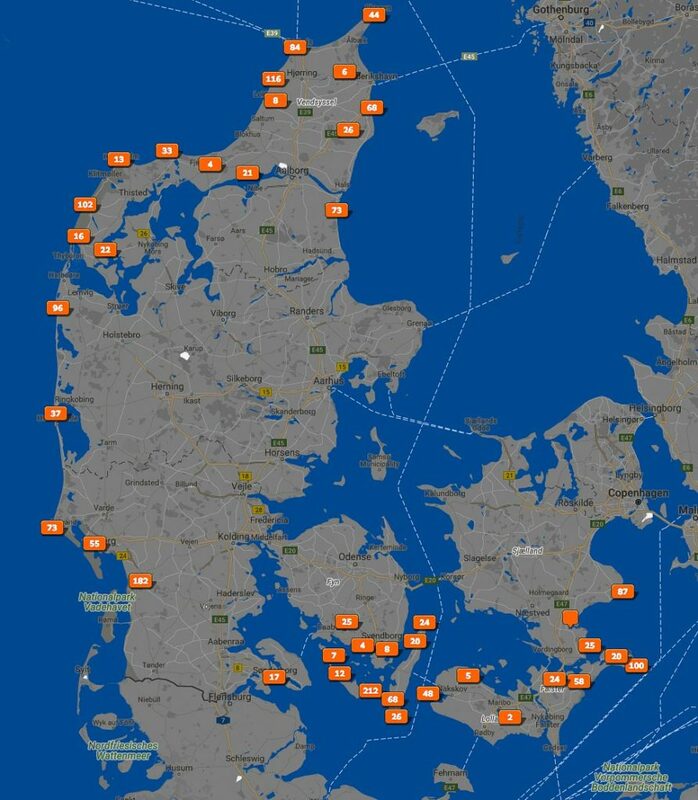 This time the southern islands of Denmark. All gems. The weather was Mediterranean just like last year. – Sønderborg. A nice castle, beautifully situated by the water. Characteristic old trees close to the castle. – The island Ærø. What a pretty sweet island. The whole island is a highlight. Unique are the beach huts at Marstal and at Ærøkøbing. – The three older fishermen, Pensioners who were celebrating life in the morning with a beer at Stranby Havn on Ærø. – The island Langeland. Like Ærø the whole island is a highlight for us. We visited the lighthouses of Hou and of Kelds Nor. Both are worthwhile visiting. The Cliff at Ristinge is quite high and style and a favorite hiking area. – The Port of Bagenkop, colorful with the old fishing boats. – The walk to the lighthouse of Albuen (Lolland). The lighthouse is not special, the road thereto is. – The area at Maribo with the small lakes on the beautiful island Lolland. The Park of Corselitze is also very nice. – The whole island Møn is a highlight, with the absolute winner this holiday the white chalk cliffs at Møns Klint. In the evening we walked on top and in the morning, we were very early at the foot of the cliff and we were there alone for several hours. A beautiful experience! It is an imposing steep coast of 7km long and a highest point of 128m (higher than Dover). – Nyord is a small peninsula, connected to Møn. Half-timbered houses, a beautiful octagonal church and a charming little harbor. – Rødvig, a busy fishing site. – Stevns Klint is more than worth visiting. The old church of Højerup of which a part of the rock is plunged into the sea, is so beautiful of simplicity. The walk from the church to the lighthouse Stevns Fyr Is impressive along the cliff.